Fried Indian bread that is so moorish and tasty. Serve up with your favourite curry or chutney. Sift the flour into a bowl with the salt and then add the coriander, chillees, cumin seeds, chilli powder and black pepper. Add the Ghee and slowly need together slowly adding up to 200ml water a little at a time. Ensuring it's all well combined and not sticky, wrap the dough in cling film and place in the fridge for 20 Minutes. Roll the dough as thin as possible on a lightly floured surface. Using a pastry cutter or chefs ring of approximately 6cm place the cut out discs as flour free as possible on a side plate. Heat the oil in a medium sized pan to 180°C, the oil should be at least 5cm deep but also have 5cm extra room below the rim of the pan for expansion. Place one or two discs into the oil at a time and hold below the surface if possible until it puffs up, once it has flip it over to cook the other side fully. Remove from he oil and drain on kitchen paper. 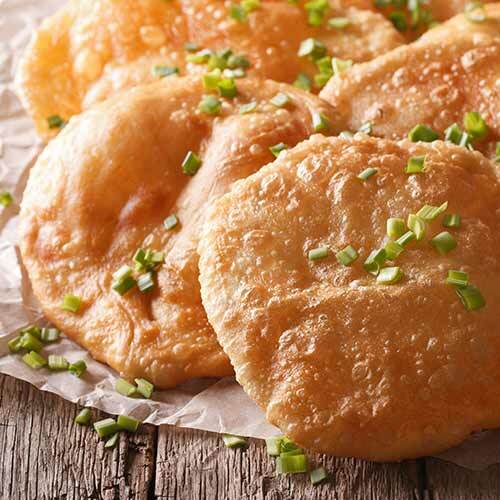 Serve with your choice of chutney and enjoy these delicious fried chapati's whilst still hot!